Near the city center of Zhangye – located along the ancient Silk Road – stands a white statue wearing a Roman robe, and underneath it spells the name “Ma Ke Bo Luo”. Next to it is a road named the European-Style Street. 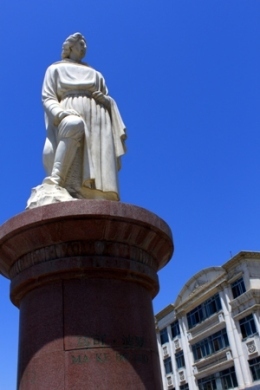 The Roman characters inscribed underneath the statue are: "Ma Ke Bo Luo", which is Marco Polo's name in Chinese pinyin. Both the statue and the street are in honor of the famed Italian traveler Marco Polo, who had visited Zhangye over 700 years ago; and the Italian mentioned at length in his travelogue about the City’s main attraction – a giant reclining Buddha measuring 35 meters. But the European-Style Street is perhaps the tackiest part of the otherwise lovely City. 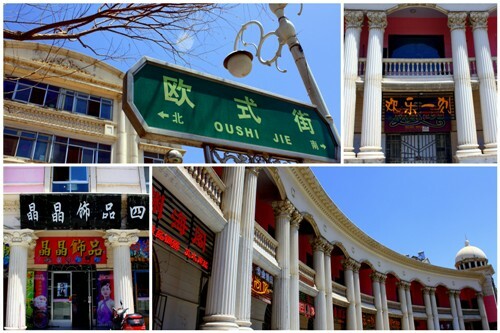 There’s nothing Europe about the street except the endless Roman pillars supporting the shop houses lining the street, all adorn with huge Chinese signboards. The street, however, has turned into a happening spot for the slow-pace City well known for its ancient wooden pagoda and giant Buddha temple. Cafes, bars and pubs, and swanky eateries flourished, and the clientele are mostly the yuppies in town. Buildings with Roman pillars lined the European-Style Street.